Last week, I wrote an article on the plight of the Aylesbury 20 something’s. Often called by the press ‘Generation Rent’. Attitudes to renting have certainly changed over the last twenty years and as my analysis suggested, this change is likely to be permanent. In the article, whilst a minority of this Generation Rent feel trapped, the majority don’t – making renting a choice not a predicament. The Royal Institution of Chartered Surveyors predicted that the private rental sector is likely to grow substantially by 1.8m households across the UK in the next 8 years, with demand for rental property unlikely to slow and newly formed households continuing to choose the rental market as opposed to buying. However, my real concern for Aylesbury homeowners and Aylesbury landlords alike, as I discussed a couple of months ago, is our mature members of the population of Aylesbury. In that article, I stated that the current OAP’s (65+ yrs in age) in Aylesbury were sitting on £2.13bn of residential property ... however, I didn’t talk in depth about the ‘Baby Boomers’, the 50yr to 64yr old Aylesbury people and what their properties are worth – and more importantly, how the current state of affairs could be holding back those younger Generation Renters. These Aylesbury Baby Boomers and OAP’s are sitting on 14,798 Aylesbury properties and many of them feel trapped in their homes, and hence I have dubbed them ‘Generation Trapped’. Recently, the English Housing Survey stated 49% of these properties owned by the Generation Trapped, as I have dubbed them, are ‘under-occupied’ (under-occupied classed as having at least two bedrooms more than needed). These houses could be better utilised by younger families, but research carried out by the Prudential suggest in Britain it’s estimated that only one in ten older people downsize while in the USA for example one in five do so. The growing numbers of older homeowners who want to downsize their home are often put off by the difficulties of moving. The charity United for all Ages, suggested recently many are put off by the lack of housing options, 19% by the hassle and cost of moving, 14% by having to declutter their possessions and 14% by family reasons such as staying close to children and grandchildren. Helping mature Aylesbury (and the Country) homeowners to downsize at the right time will also enable younger Aylesbury people to find the homes they need – meaning every generation wins, both young and old. However, to ensure downsizing works, as a country, we need more choices for these ‘last time buyers’. Theresa May and Philip Hammond can do their part and consider stamp duty tax breaks for downsizers, our local Council in Aylesbury and the Planning Dept. should play their part, as should landlords and property investors to ensure Aylesbury’s ‘Generation Trapped’ can find suitable property locally, close to friends, family and facilities. The good old days of the 1970’s and 1980’s … with such highlights lowlights as 24% inflation, 17% interest rates, 3 day working week, 13% unemployment, power cuts ... those were the days (not)… but at least people could afford to buy their own home. So why aren’t the 20 and 30 something’s buying in the same numbers as they were 30 or 40 years ago? Many people blame the credit crunch and global recession of 2008, which had an enormous impact on the Aylesbury (and UK) housing market. Predominantly, the 20 something first-time buyers who, confronting a problematic mortgage market, the perceived need for big deposits, reduced job security and declining disposable income, discovered it challenging to assemble the monetary means to get on to the Aylesbury property ladder. However, I would say there has been something else at play other than the issue of raising a deposit - having sufficient income and rising property prices in Aylesbury. Whilst these are important factors and barriers to homeownership, there has been a generational change in attitudes towards home ownership in Aylesbury (and in fact the rest of the Country). Back in 2011, the Halifax did a survey of thousands of tenants and 19% of tenants said they had no plans to buy a home for themselves. A recent, almost identical survey of tenants, carried out by The Deposit Protection Service revealed, in late 2016, that figure had risen to 38.4%, with many no-longer equating home ownership to success and believing renting to be better suited to their lifestyle. You see, I believe renting is a fundamental part of the housing sector, and a meaningful proportion of the younger adult members of the Aylesbury population choose to be tenants as it better suits their plans and lifestyle. 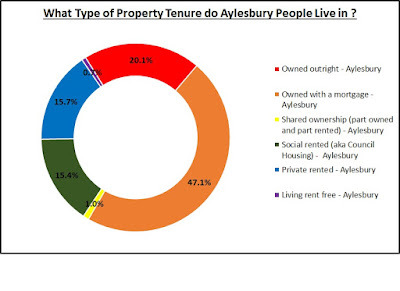 Local Government in Aylesbury (including the planners – especially the planners), land owners and landlords need an adaptable Aylesbury residential property sector that allows the diverse choices of these Aylesbury 20 and 30 year olds to be met. This means, if we applied the same percentages to the current 11,162 Aylesbury tenants in their 4,701 private rental properties, 4,286 tenants have no plans to ever buy a property – good news for the landlords of those 1,805 properties. Interestingly, in the same report, just under two thirds (62%) of tenants said they didn’t expect to buy within the next year. ... but does that mean the other third will be buying in Aylesbury in the next 12 months? Some will, but most won’t … in fact, the Royal Institution of Chartered Surveyors (RICS) predicts that, by 2025, that the number of people renting will increase, not drop. Yes, many tenants might hope to buy but the reality is different for the reasons set out above. RICS predicts the number of tenants looking to rent will increase by 1.8 million households by 2025, as rising house prices continue to make home ownership increasingly unaffordable for younger generations. So, if we applied this rise to Aylesbury, we will in fact need an additional 2,015 private rental properties over the next eight years (or 252 a year) … meaning the number of private rented properties in Aylesbury is projected to rise to an eye watering 6,716 households. 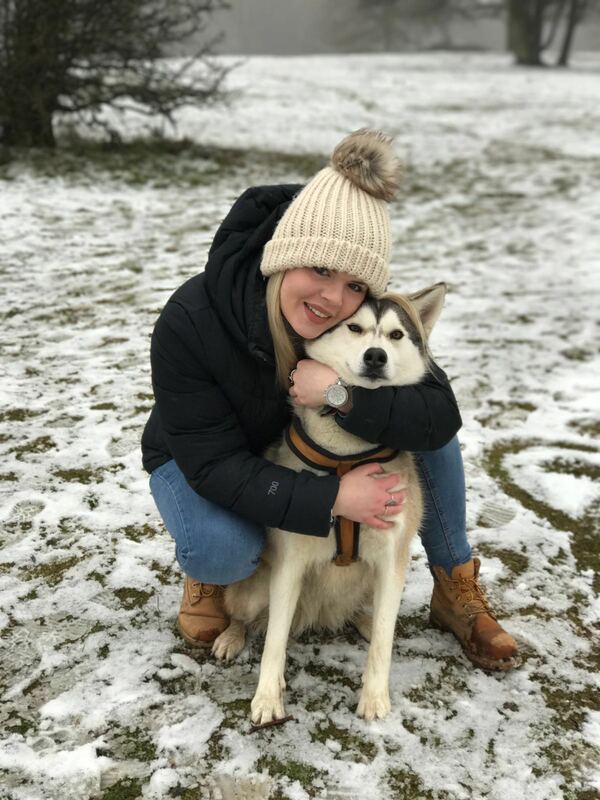 Nala feeling loved in the snow. Over the last 12 months in the UK, 1,061,557 properties were sold with a total value of £223.74 bn. To give that some context, ten years ago 1,581,727 properties sold with a total value of £405.56bn, so it can be seen the number of people moving house has dropped by over a third over the last decade. Whether you are a landlord, homeowner or tenant, it’s always good to keep an eye on the Aylesbury property market. Over the last 12 months, 2,084 properties have sold (and completed) in Aylesbury, worth £679.9m. The number of properties changing hands in Aylesbury has also dropped when compared to a decade ago. First time buyers in 2017 are likely to benefit from a slight decline in Aylesbury buy-to-let investors. Those looking to buy a home in the spring and summer of 2017 will face a less competitive Aylesbury property market than the same time of year in 2016, when the urgency to beat the buy-to-let stamp duty hike was in full swing. When looking at the figures for Aylesbury itself, first time buyers have borrowed more than £100.1m in the last 12 months to buy their first home. This is a ringing endorsement of their confidence in their jobs and the local Aylesbury economy. 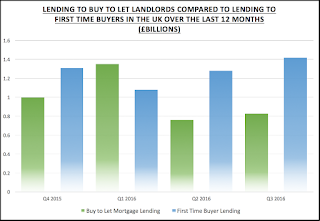 Those who are considering being first time buyers in 2017 will find that the number of properties on the market has not been as good for quite a while, meaning they have more choice of properties and less competition from buy-to-let landlords than a year ago. Rightmove announced nationally that new seller enquiries are 26% up on the same time last year giving the stoutest indication that we may see a slight ease in the lack of properties on the market. When I looked at Aylesbury, there were 405 properties for sale, compared to 243 properties a year ago. All this will be welcome news amongst Aylesbury first-time buyers with a combination of a proportional reduction in new investors and landlords. 2017 will be an interesting year for all homeowners, be they buy-to-let landlords, existing homeowners or future homeowners. 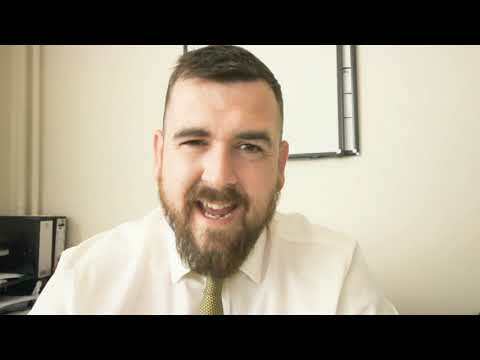 The second in our series of videos discussing the Aylesbury property market and all things lettings. We try to deliver news and property articles in a format that you can enjoy...any comments will be welcomed. With 11,162 people in Private Rented Properties in Aylesbury - Should you still be investing in Aylesbury Buy To Let? As a buy to let landlord in Aylesbury today, I feel a little bruised by the assault made on my wallet after being (and continuing to be) ransacked over the last 12 months by HM Treasury’s tax changes on buy to let. To add insult to injury there has been a tempering of the Aylesbury property market with property prices not increasing by the levels we have seen in the last few years. I don’t think we will see a drop in property prices this year but if Aylesbury property prices did drop, the downside is that first time buyers could be attracted back into the Aylesbury property market. This would mean less demand for renting (rents would go down). Yet, before we all run for the hills, these things could be serendipitous to Aylesbury landlords, almost a blessing in disguise if this was to be the case. Yields will rise if Aylesbury property prices fall, which will also make it easier to obtain a buy to let mortgage, as the income would cover more of the interest cost. If property values were to level off or come down that could help Aylesbury landlords add to their portfolio. Rental demand in Aylesbury is expected to stay solid and probably even see improvements. However, there is something even more important that Aylesbury landlords should be aware of: the change in the nature of these 20 something potential first time buyers. I have just come back from a visit to relations after a family get together. I got chatting with a nephew and his partner. Both are in their mid/late twenties, both have decent jobs and they rent. Yet, here was the bombshell, they were planning to rent for the foreseeable future with no plans to even save for a deposit, let alone buy a property. I enquired why they weren’t planning to buy? The answers surprised me as a 50 something, and it will you. Firstly, they don’t want to put cash into property, they would rather spend it on living and socialising by going on nice holidays and buying the latest tech and gadgets. They want the flexibility to live where they choose and finally, they don’t like the idea of paying for repairs. All their friends feel the same. I was quite taken aback that buying a house is just not top of the list for these youngsters. So, as 15.7% of Aylesbury people are in rented accommodation and as that figure is set to grow over the next decade, now might just be a good time to buy property in Aylesbury – because what else are you going to invest in? Give your money to the stock market run by sharp suited city whizz kids – because at least with property – it’s something you can touch - there is nothing like bricks and mortar! What is worth buying to let in Aylesbury, my top 3. The Aylesbury sales market continues to be surprisingly strong. I expected prices to falter a little in the first quarter of 2017 as buyers sat on the fence and landlords took stock of what is going on . But prices are still solid although we are seeing the usual first quarter optimistic overpricing with some agents so you need to carry out your research before committing as usual. As has been the case for some time these bullish prices are supported by a lack of supply rather than a strong demand...but there is no sign of this changing any time soon. In this environment good purchases are hard to find, no such thing as a bargain any more! However there are still sensible buys and a hunt around today shows the following three properties. Only one of these is available via Mortimers, you will need to follow the link and contact the selling agents directly for any interest in the others. What appears to be a smart two bedroom flat on Fairford Leys £195,000 guide price. There is very little of quality sub £200k when it comes to two bedroom apartments in good locations, this one appears to fit the bill. It is of the smaller design without an ensuite but still works well as a rental. You should see a rental return of around £825 giving a gross yield of over 5%. If you can nibble the price down to £190,000 and improve the rent to £850 this increases to 5.36% gross yield...very respectable. In 2014 these and similar were selling for around £150,000 so there has been good capital growth which looks set to continue. This looks like a good buy and in good condition, not sure why it has been on the market since December unless the agent has failed to change it's status. In any event tis represents good value for a buy to let likely to let for around £850 giving a gross yield of 4.16% with great potential for capital growth. Good presentation, cloakroom and garage are some of the benefits from this modern house on the edge of the estate. The price is sensible, £264,950 and you are likely to achieve a rent around £900 giving a respectable gross yield of 4.07%. But the big plus for Fairford Leys property is the potential for good capital growth whilst achieving good rent , low maintenance costs and a lack of void periods. Properties similar to this were selling in the region of £190,000 in 2014 and at present the potential for further capital growth looks good. This house would be a great property to start off your portfolio or indeed a great addition to an existing one. Recent statistics published by the Office of National Statistics show that there are 267,704 private rented households in the Country that are occupied by people aged 65 and older, meaning 4.39% of OAP’s are living in private rented property. It got me thinking two things. How many of these OAP’s have always rented and how many have sold up and become a tenant? In retirement, selling up could make financial sense to the mature generation in Aylesbury, potentially allowing them to liquidate the equity of their main home to enhance their retirement income. I wanted to know why these older people rent and whether there was opportunity for the buy to let landlords of Aylesbury? The Prudential published a survey recently that said nearly six out of ten OAP renters had never owned a home. Two out of ten OAP renters were required to sell up because of debt, just about one in ten OAP renters sold their property to use the money to fund their retirement and the remaining one out ten OAP renters, rented for other reasons. Funding retirement is important as the life expectancy of someone from Aylesbury at age 65 (years) is 19.4 years for males and 21.6 years for females (interesting when compared to the National Average of 18.7 years for males and 21.1 years for females). The burdens of financing a long retirement are being felt by many mature people of Aylesbury. The state of play is not helped by rising living costs and ultra-low interest rates reducing returns for savers. So, what of Aylesbury? Of the 5,611 households in Aylesbury, whose head of the household is 65 or over, not surprisingly 4,291 of households were owned (76.47%) and 1,016 (18.11%) were in social housing. However, the figure that fascinated me was the 181 (3.23%) households that were in privately rented properties. Anecdotal evidence, by talking to both my team and other Aylesbury property professionals is that this figure is rising. More and more Aylesbury OAP’s are selling their large Aylesbury homes and renting something more manageable, allowing them to release all of their equity from their old home. This equity can be gifted to grandchildren (allowing them to get on the property ladder), invested in plans that produce a decent income and while living the life they want to live. These Aylesbury OAP renters know they have a fixed monthly expenditure and can budget accordingly with the peace of mind that their property maintenance and the upkeep of the buildings are included in the rent. Many landlords will also include gardening in the rent! Renting is also more adaptable to the trials of being an OAP - the capability to move at short notice can be convenient for those moving into nursing homes, and it doesn't leave family members panicking to sell the property to fund care-home fees. Aylesbury landlords should seriously consider low maintenance semi-detached bungalows on decent bus routes and close to doctor’s surgeries as a potential investment strategy to broaden their portfolio. Get it right and you will have a wonderful tenant, who if the property offers everything a mature tenant wants and needs, will pay top dollar in rent! In times when landlords and their returns are being put under pressure it can pay to consider alternative strategies. This is what happens when you ask a Husky to smile for the camera!